Want to know our dirty little secret? … It’s our Tupperware cupboard (embarrassing I know). In our kitchen it’s just that cupboard thats always neglected and everything is just thrown in – we hope there’s not an avalanche of plastic containers spilling on the floor! I plan on tackling this cupboard over the next week, wish me luck! I’ll post with the finished result when I’m done 🙂 watch this space! 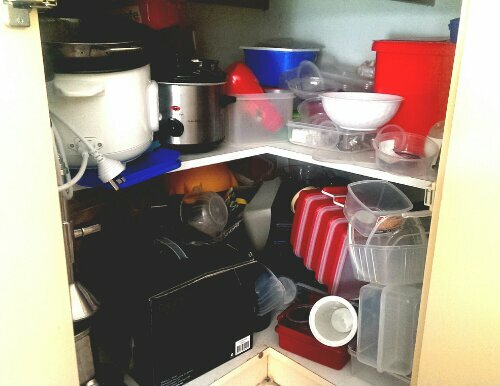 Here’s the current state of the cupboard. What’s your dirty little secret? ‘Buy nothing new for a year’, is what Little Pop wanted for her 21st Birthday. As a parent I support my child in her their pursuits, this request was more than that for me. To be honest I’m not entirely sure what I buy that is so bad, but Little Pop assures me that we will be significantly decreasing our environmental footprint by doing this. We still haven’t established any definitive rules around what we can and can’t buy (although we really should get onto doing that) but I plan on buying as much food as possible from local farmers and thus reducing the environmental costs associated with spraying, transporting and packaging the foods we buy (I know this isn’t really classified as buying nothing new but I am really planning on getting back to our roots when it comes to food). Back to buying nothing new… We are a household of two girls so as you can imagine clothes are probably the biggest product we tend to buy new. We are a household of collectors, you never know when you will need it. We went to my wardrobe tonight and found a skirt I have had since I was 17 yrs old because ‘one day I will fit it!‘. I would like to have a go at making things like skin care products myself from locally sourced resources wherever possible. I plan on implementing a similar strategy in regards to cleaning products although this won’t be a huge difference to the way our household operates now. Due to health reasons i am unable to use powerful chemical cleaning products so most of the time we use natural home made cleaning products anyway. those who know me knows that I love my bicarb soda and lemon juice (these two are must have for anyone looking to make their own cleaning products!) – soap flakes, natural oils and vinegar are also great! I plan on regularly putting up posts with various home made cleaning product recipes and showing the results they can have (for proof of course!) for anyone looking to take a more natural approach when it comes to the cleaning of the house. Oh and lastly…something I’m looking forward to with ‘buy nothing new’ is de-cluttering our house! We have a third bedroom that is unusable due to’ stuff’ – note that cleaning this room does not mean buying storage solutions, but to really look at what we need and get rid of anything we no longer need. Stay healthy and happy ..Big Pop.